As we all know, Son of Beast was a fantastic ride. However, it had well known structural issues as well. From a structural engineering standpoint, there are now materials in CE fields to reinforce and redesign deficient structures (wood, concrete, steel, e.t.c.) at a very low rate. That being said, if these new methods were available at the time the decision was made to tear down SOB, do you think the park would have made the same decision? This is a hypothetical situation, I’m just curious to hear what people’s thoughts on this would be. Yes, the park would have made the same decision. 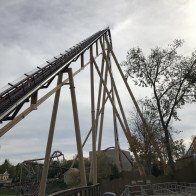 Son of Beast had become such a PR story in the Cincinnati area that even if Kings Island spent millions renovating and updgrading it, one minor hiccup would have become instant front-page news. Ultimately, it was that fact that led to the ride's demolition in the first place. You kinda ask two different questions there. Could it have been saved? Absolutely. Would it have been with modern methods? Probably not. Let me restate my question: If we knew what we did about composites and rehabilitation techniques in 2012, do you think the park would have saved either the ride or structure for RMC? I'll always have a soft spot for that ride. It debuted right when I was getting into roller coasters and I had just received Roller Coaster Tycoon for the first time when SOB was announced. I mean, who wasn't amazed by that announcement? And when it was built, that structure was SO impressive looking! What a time to be alive! I even had the chance to walk its structure on a few occasions (shameless plug). Let's be real, though. The ride sucked and anyone who generally liked it always must add "but" to their statement. The ride always had an asterisk next to its reputation. Could it physically have been fixed? Sure, I bet there was an engineering solution. But, even if you gave it the "RMC treatment," every article, mention, and story was going to declare what the ride used to be and what it was known for (the 2006 accident, the later allegations, etc.). Even if it had Steel Vengeance levels of notoriety, SOB's past would always be looming. The Son of Beast name was tainted. Better to remove it and let it fade away into the annals of history. I also sincerely doubt you ever see a ride themed/named to anything resembling "son" or "family" "of Beast" again. Why bring up bad press? For those who never rode it: the view from the top just before you rocketed down the hill was incredible. The rest of the ride was misery. The loop was pretty good as well (mostly because it used a steel structure which made it smooth). A surprisingly forceful loop for beings so big. In 2012, no. At that point, they would have already had a contract with B&M for Banshee. If you go back before then, I'm sure there's a point where they would have. The year it stopped running, if they could have fixed it, they probably would have done so. The farther you get from there, the less likely for a fix. True, but the same could be said with Rattler at SFFT. That ride was designed to be 120 ft tall, but the news about MS forced the park to add 60 feet to the ride. Whenever you’re forced to radically redesign something with 90% of it designed and engineered, you’re asking for problems. I do enjoy watching the OG Rattler POV. What an ...interesting... ride. Not to mention that it was removed 7 years ago. That's a long time for RMC to develop and learn. Maybe the solution would have been there if they had to make that decision today but it simply was too risky at the time. As we all know, Son of Beast was a fantastic ride. You lost me after the first line! I doubt they would have saved it as it had become too notorious. When the best part of a wooden coaster is the steel loop you know you have a problem. It was a great idea in theory and I will always have found memories watching it being built in '99 but it being gone is for the best. Banshee and Mystic Timbers are a significant upgrade over what Son of Beast was. I doubt they would be able to save the coaster, as said from many sources that the support structure was almost entirely made of sub-grade lumber. And then they'd have to retrack due to how rough it was. Since The Beast is the enemy of all that is good, if he had a son, I doubt that he could be saved. Mods: if this is a violation of TOS, please remove and accept my apology. How have you been here as long as you have and realize that is certainly not the case? Did you not read the bazillion of other topics involving Son of Beast around here? It's pretty naive to start with that premise. From the research we have done for @KI50Movie_Official, I can tell you CF made the right choice to remove it. There were a lot of issues and an enormous amount of money thrown at it. It was just not fiscally responsible to keep it in operation. It was a beautiful ride and would captivate me when arriving at the park. I wish I would have bought a camera before it was gone. Well, thanks, @Oldschool75! Shoot me a DM or FB message and I'm sure we can work something out. I’ll give you the first drop was cool, but once you were at the bottom of the hill the nightmare began. Personally I loved the loop, it was nice and smooth...that is the only thing that kept getting me back on it every now and then. I am not sure you were riding the same ride as the rest of us? I agree with @standbyme. The first drop was the best first drop of any wood coaster I have ever ridden. After that though, it was not a fun experience. That lift hill and drop was a thing of beauty. I also loved how you would see the loop right as the train left the station. This summer it will have been 10 years since the ride last operated. It sat SBNO for 3 years before it was removed. The decision to remove the ride was made with the best information available at the time. Tearing it down instead of letting it sit SBNO for who knows how long was the right choice at the time. It's easy to sit here and second guess the choices using information that did not exist at the time, but frankly even with the knowledge that we have today if you had told the executives at that point in time what would be possible in 5 to 10 years, I am not certain they would have done anything differently. I am comfortable saying that today the ride would be fixable, but I cannot tell you if it would be worth fixing. I have no idea just how much it would cost and if those costs could be justified. It does feel like it is beyond time to move on though, stop worrying if it was fixable. Because I am positive that there are enthusiasts who have spent more time discussing and second guessing the decision then the people who actually made it. I will join the chorus that SOB was beautiful to look at and the first hill was incredible. I can't say whether or not it was fixable in later years, but I think the only the way it could've truly been fixed is if it had built right in the first place. - There's a pinch break on the straight piece of track shortly after you leave the station. I don't believe that was one of the ride's block sections, but once heard that the original station was supposed to be longer with zones for loading and unloading, thus allowing the ride to accommodate 3-4 trains. I also seem to recall seeing a third train Premeir train in storage and that the ride was originally supposed to have three. Any truth to that? ever tested valleyed in that dip with all the park executives watching from the Eifel Tower. Did that happen? - Any idea why they never built tunnels into the ride ala its predecessor? - Also remember reading that SOB was the world's largest wooden structure and that it held a record for crossing over and under itself more times than any coaster. Did they ever promote it with those records? If you have any insight, I'd love to hear it! I also loved how you would see the loop right as the train left the station. What an aesthetically pleasing ride it was. I originally thought it was odd that the lift hill was the only thing you could see, like it was just a massive wooden blob. Then you boarded the train and pulled out to see that loop in the distance. So darn cool. And at the top of the hill—everything out in the distance looked insane. And it was. Because the ride was never all that fun. But darn it looked good. Also enjoyed how the first drop ran parallel to the loop, making people think that the loop would happen first. Looking back now, do I think it could be saved? Yes, but knowing that the structure wasn't built well along with its reputation, I think it would easier to build an entirely new wooden/RMC there or something like that next to Banshee. I never got to ride it with or without loop (since my first visit to KI was in 2008 and my family really didn't go to that side of the park) but if the structure was in that bad of shape when it went SBNO to never reopen, I don't think CF would necessarily want to spend the money to fix it now. It would probably be easier just to build an entirely new wooden coaster, add a zero g roll or another inversion, and congrats! We now have an inverting wooden roller coaster that is actually reliable at Kings Island.